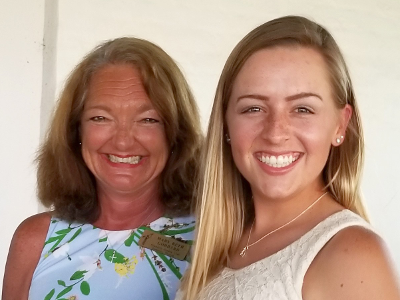 The Founders Garden Club of Sarasota is sponsoring a Scholarship to give a College Student an opportunity to further his or her special field thereby enhancing the life of that student and adding knowledge to their particular field of endeavor. The Scholarship Committee will award a $2,500 need based scholarship to an eligible Junior, Senior or Graduate Student, who is currently enrolled at an accredited college or university. We would like to lend assistance to and help recognize and inspire a college student majoring in a subject pertaining to the natural science field at an accredited college or university. Fields of study may include, but are not limited to Botany, Coastal Wetlands, Conservation and Ecology, Garden History and Design, Horticulture, Landscape Architecture, Pollinator Research, Photography and Floral Design. The Scholarship Committee of the Founders Garden Club is pleased to announce Courtney Kern as the Club's first $2,500 Scholarship recipient. She has been accepted into Florida Gulf Coast University's M.S. Environmental Science Program and will begin her graduate studies in August. This award has been granted on the basis of financial need and an outstanding academic record in her studies in ornithology at FGCU. In addition to her studies, Courtney was selected for the Audubon Florida's Conservation Leadership Initiative program and then went on to complete 135 plus hours as an unpaid intern at Audubon's Western Everglades Research Center at Corkscrew Swamp Sanctuary. She also is a Board Member for the local SWFL chapter of the Audubon Society. Courtney's pursuit and interest in expanding her knowledge of studying birds aligns perfectly with the Garden Club of America's partnership with the National Audubon Society as the year 2018 was designated the Year of the Bird. Mary Beth Goddard, Chairman of the Scholarship Committee, presented Courtney with the Scholarship at the Founder's annual May Awards meeting. The Scholarship will be given annually to eligible college Junior, Senior and Graduate Students pursuing a degree in the Natural Sciences. The purposes of Founders are to stimulate interest in horticulture and the artistic use of plant materials to promote the protection of trees, shrubs, wildflowers and birds; to encourage civic beautification; to foster education regarding conservation and preservation of natural resources; and to support activities in support of those objectives. Founders Garden Club is a member of the Garden Club of America.